We wear teal to show a sign of solidarity with those fighting cervical cancer, ovarian cancer, scleroderma, or myasthenia gravis. You can too when you display this beautiful Christmas ornament on your tree this year. 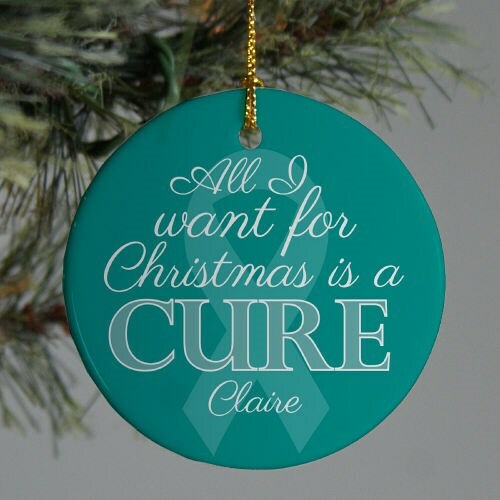 This "All I Want for Christmas is a CURE" Ceramic Ornament is a flat ornament and measures 2.75" in diameter. The Ornament includes a ribbon loop so it can easily hang from your tree or ornament stand. Free personalization of any name is included. Additional Info Show support for your family and friends who are fighting for their lives when you hang this ornament on your tree. We're sure all they'd like for Christmas is a cure. For breast cancer awareness ornaments, try this one.